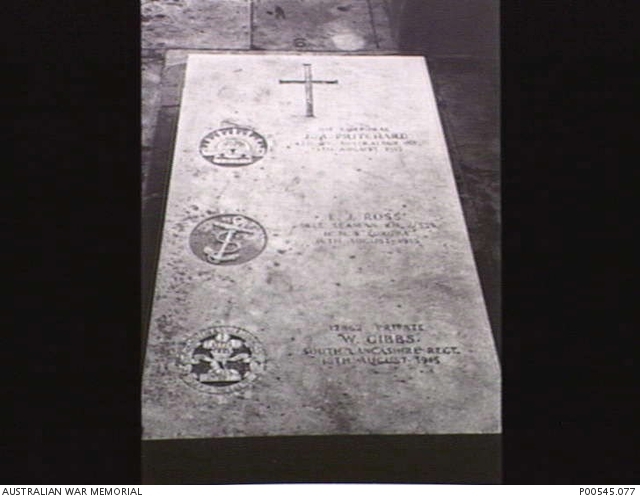 The graves of 1111 Corporal (Cpl) John Alfred Pritchard, 4th Battalion, and two unidentified British servicemen. Cpl Pritchard, a native of London, England, had previously served for 12 years in the Royal Marines and was a labourer from Annandale, NSW prior to enlistment. He embarked with the rank of Lance Corporal with A Company from Sydney on HMAT Euripides on 20 October 1914. After being wounded in action at Gallipoli, he was evacuated to Malta where, on 13 August 1915, he died of septicaemia, aged 30, and was buried in the Pieta Military Cemetery. His brother, 1273 Lance Corporal Reuben Frank Pritchard, 17th Battalion, died of wounds on 16 November 1917.